Leading the post-independence development of the country, Chandigarh represents the first planned city built after the colonial-era ended. Start off your visit on the 21st (Fri): take in the spiritual surroundings of Kansa Devi Temple, then don't miss a visit to Gurudwara Nada Sahib, and then buy something for everyone on your list at Elante mall. For more things to do, reviews, where to stay, and more tourist information, use the Chandigarh day trip planning tool . New Delhi to Chandigarh is an approximately 3-hour flight. You can also drive; or take a train. Expect somewhat warmer evenings in Chandigarh when traveling from New Delhi in December, with lows around 17°C. Finish up your sightseeing early on the 21st (Fri) so you can travel to Jaipur. Known as the "Pink City" because of the color of the stone used for many of its notable structures, Jaipur draws visitors with its chaotic street life and a slew of colorful bazaars selling everything from handmade pottery to tie-dye scarves. Start off your visit on the 22nd (Sat): see the sky in a new way at Jantar Mantar - Jaipur, then admire the striking features of Hawa Mahal - Palace of Wind, then steep yourself in history at Amber Palace, and finally admire the landmark architecture of Jal Mahal. On the 23rd (Sun), you'll have a packed day of sightseeing: take an in-depth tour of City Palace of Jaipur, then contemplate in the serene atmosphere at Moti Dungari Temple, then contemplate in the serene atmosphere at Govind Dev Ji Temple, and finally relax and rejuvenate at some of the top local wellness centers. For reviews, ratings, more things to do, and more tourist information, read Jaipur online travel planner . Fly from Chandigarh to Jaipur in 2.5 hours. Alternatively, you can drive; or take a train. Traveling from Chandigarh in December, expect nights in Jaipur to be slightly colder, around 11°C, while days are a bit warmer, around 30°C. Finish up your sightseeing early on the 23rd (Sun) so you can travel to Udaipur. Tourism in Udaipur, a picturesque city known for its lake system, thrives due to the area's numerous historic and cultural relics. Start off your visit on the 24th (Mon): surround yourself with nature on a nature and wildlife tour, contemplate the waterfront views at Lake Pichola, and then relax and rejuvenate at some of the top local wellness centers. On the next day, stop by Little Armani, then take an in-depth tour of City Palace of Udaipur, and then contemplate in the serene atmosphere at ShreenathJi Temple. 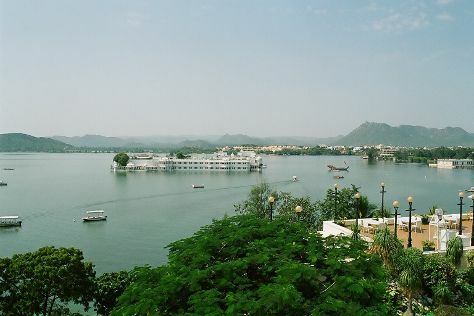 To see traveler tips, other places to visit, and other tourist information, use the Udaipur trip planner. Getting from Jaipur to Udaipur by flight takes about 1.5 hours. Other options: drive; or take a bus. In December, daytime highs in Udaipur are 29°C, while nighttime lows are 10°C. Finish up your sightseeing early on the 25th (Tue) so you can travel back home.